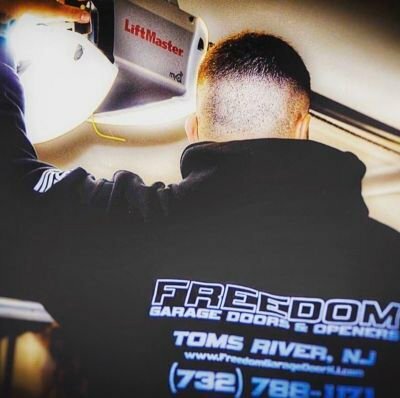 Freedom Garage Door is family owned & operated garage door and opener business. We offer repairs, service and new installations of garage doors and openers. For over 90% of Americans, garage doors not only serve as a main entrance, but greatly contribute to the overall aesthetics and curb appeal of the home as well. We work with many different garage door manufactures to help customers choose the perfect garage door for their home. Garage door lifting/moving components wear out over time as well as the opener itself. The garage door is the largest moving part of a home and we can bring it up to all current standards and safety regulations. Call and schedule an appointment with one of our experts today! Garage door components wear out over time and will need to be replaced and/or serviced. Springs, pulleys, cables, rollers, bearings and drums can all be replaced and fixed to better than new. We offer special rebuild packages for a discounted rate to ensure a longer lifespan and worry free operation of your garage door. The garage door opener (also commonly referred to as the motor) can also fail after time due to the strain caused from an unbalanced garage door. We are a proud LiftMaster certified installer. We offer many different options to choose from to best fit each door and customers specific needs. Replacing and/or upgrading a garage door is very common. Garage doors are almost a 99% return on investment and bring lots of curb appeal to a new home. New doors also offer much higher insulation (R-Value) to keep the garage warm in the winter and cool in the summer.